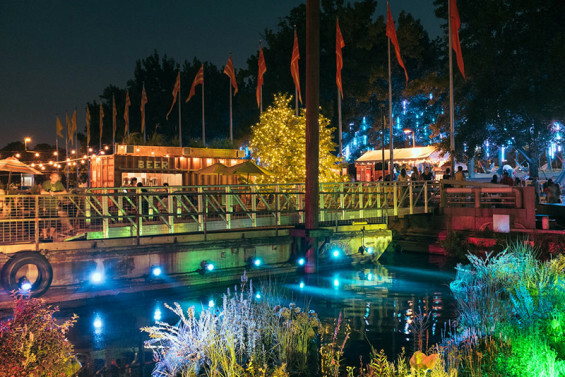 Spruce Street Harbor Park (SSHP) is a temporary intervention that reconnects Philadelphia to an underutilized park on the Delaware River and extends the public green space into the river’s channel. 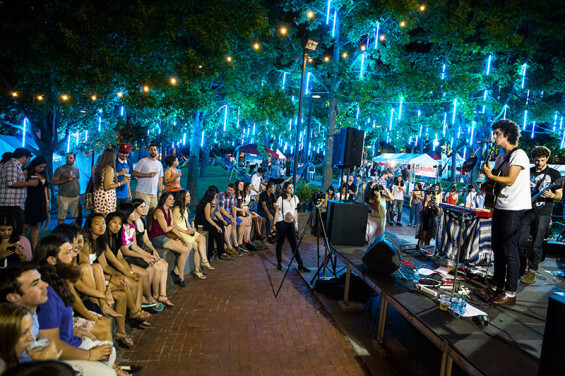 Located at the Christopher Columbus Memorial at Penn’s Landing, SSHP is a true celebration of the Delaware River as a place where fun and recreation meets commerce and industry. 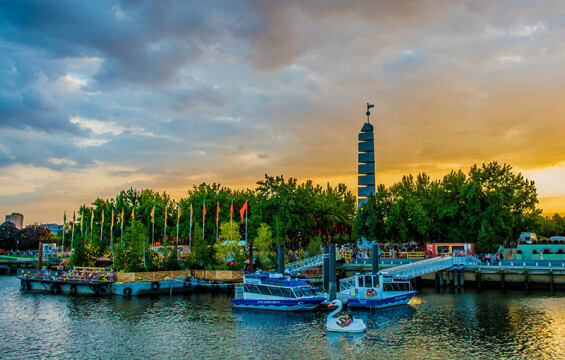 This theme is reflected in the three commercial barges that were tugged twenty miles upriver from Chester, Pennsylvania, to expand the existing park. 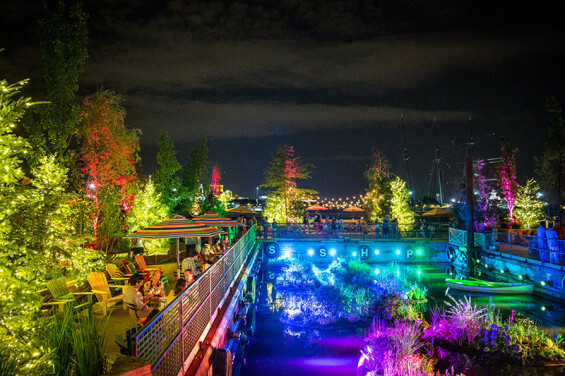 The barges create a platform for two shipping containers sourced locally from Camden, New Jersey, just across the river. Sounds typical, but these containers have been modified to serve food and drinks. 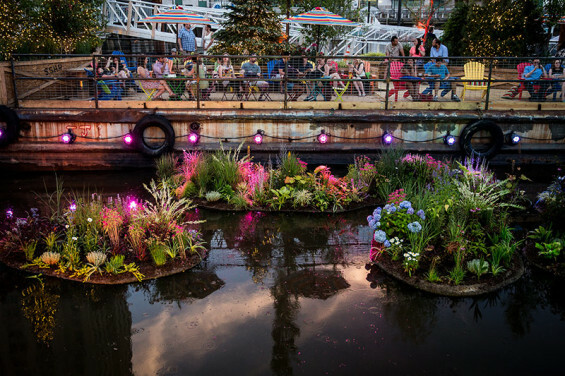 The barges also provide lounge areas and ample seating amongst the vivid plantings and dappled shade provided by the large trees planted on the decks of each barge. Located in the center of their u‐shaped configuration lily pads and floating gardens sway gently on the water’s surface, creating a focal point for visitors while cleansing the water below. A cantilevered net lounge on the barges’ western edge offers visitors the unique opportunity to sit in suspension over the water. 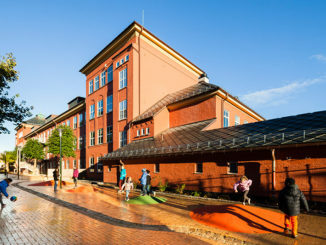 Onshore, SSHP reactivates the existing park with whimsical elements. 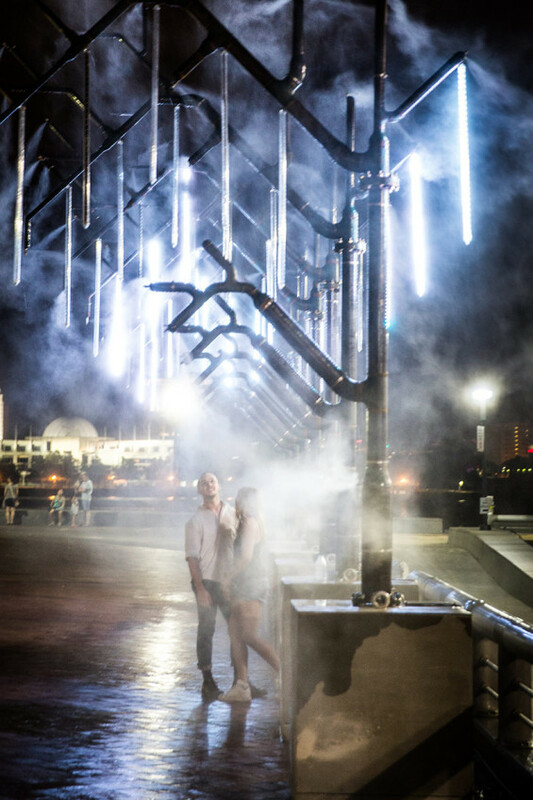 Seven pipefitted “trees” designed and fabricated by local artists sprinkle passersby with refreshing mist. 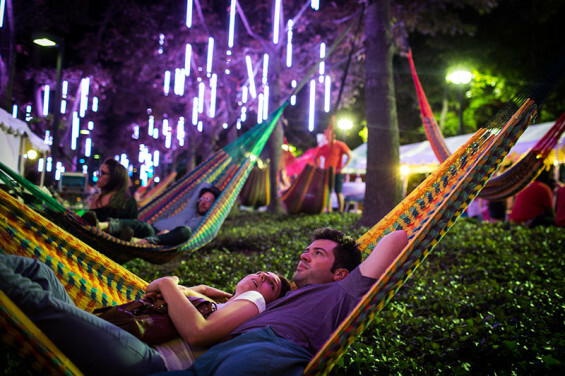 A garden of brightly colored hammocks hang between existing trees, inviting guests to lay back and relax. In the canopy above shines an array of LED lights inviting visitors to see the space anew. 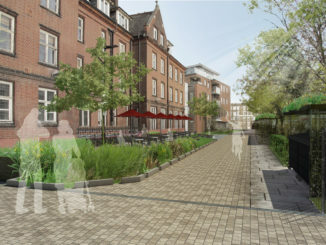 SSHP sits at the heart of the Master Plan for the Central Delaware. 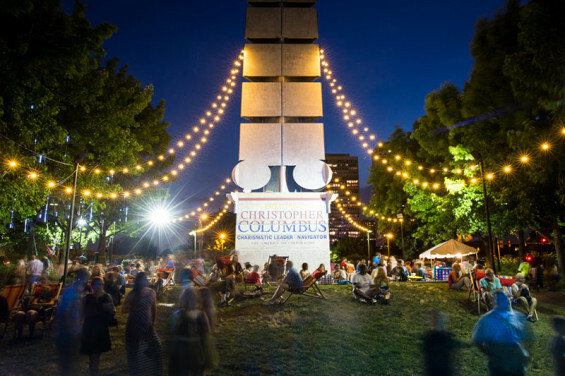 Open for four months in the summer of 2014 the park will become a seasonal fixture along the riverfront featuring local performers, artists, and restaurateurs, as well as a range of activities that draws visitors of all ages, seven days a week. 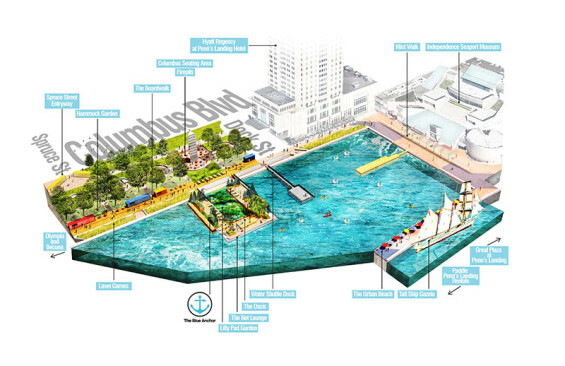 In this way, SSHP acts as a pivotal precursor to the changes called for in the master plan, demonstrating to the community how exciting its waterfront can be and encouraging interest and investment.